Quiz: How Well Do You Know Mary, Queen of Scots? 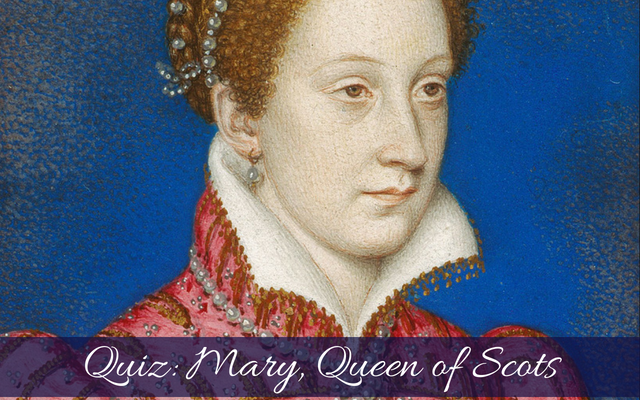 With the upcoming release of the movie about Mary, Queen of Scots, I thought it fitting that we should test our knowledge on the most well-known Scottish queen – Mary, Queen of Scots. How well do you know Mary, Queen of Scots? Here is your chance to test your knowledge. Share with friends! We know that Elizabeth and Mary would call each other “sister” on occasion – how were they actually related? Elizabeth was the daughter of Henry VIII – Henry’s sister, Margaret Tudor was the grandmother of Mary, Queen of Scots. Who was married more often, Mary, Queen of Scots or Kateryn Parr? Kateryn Parr was married four times while Mary married three times. How tall is Mary reported to have been? Mary must have received some of the genetics from her great uncle, Henry VIII. She was indeed six feet tall. Who was James Stewart, Earl of Moray, to Mary, Queen of Scots? Stewart was indeed Mary’s half-brother. Of the following women, which was NOT a mother-in-law to Mary, Queen of Scots? Jane Guildford was the mother of Robert Dudley, Earl of Leicester. Agnes Sinclair was the mother of the Earl of Bothwell, de Medici the mother of Francis II and Margaret Douglas the mother of Henry Stuart, Lord Darnley. Which of the following men was executed for conspiring to marry Mary and place her on the English throne? It was Thomas Howard, 4th Duke of Norfolk who lost his head because he wished to marry Elizabeth’s rival and place her on the throne of England. Mary was imprisoned in this castle and then escaped in 1568, which castle? How old was Elizabeth Tudor when Mary Stuart was born? Elizabeth Tudor was born in September 1533, while Mary was born in December 1542 – making Elizabeth 9 at the birth of her royal cousin. Which of the following men was NOT a prospect for marriage to the Queen of Scots? Robert Dudley, Earl of Essex along with Henry Stuart and the Archduke Charles of Austria were all prospects for marriage to the Scottish queen. Of course she married Darnley and not the others. Who was the parents of Mary, Queen of Scots? Mary’s father was King James V of Scotland her mother was Marie de Guise.